Following the last post (if you just landed on this article, we suggest you read the previous one first), the rest of the checklist of issues related to choosing the best possible OSP is as below. In the previous post we covered the questions to ask the OSP regarding background on the country the OSP works from, finding out more about the OSP, and finding out more about the OSP Staff. In part 2 we look at issues with respect to the work itself, physical security, logical security, and legal issues. We round this out with doing a bit of online sleuthing to have a look at their digital footprint. In part 1 we covered the people doing the work, and the office in which they work. Next is important to check more about the work, which is the final product. Part of evaluation of the work, includes the delivery of work. How does the work progress through the OSP? Are there fixed fees? This is important as a fixed price job enables the OSP to ensure workers perform at agreed levels, versus the problems of providing unqualified offshore staff. Are there fixed levels of work? This relates more to the provision of unqualified offshore staff. What is the capacity of the OSP? Can it provide work on an ongoing basis? What are the turnaround times on the work sent? Consider busy seasons. Ask when is the better time to send work over, and adjust your own firm’s processes to maximize the OSP offering. What job functions are you going to outsource? e.g. data entry, bookkeeping, tax, financial planning etc. 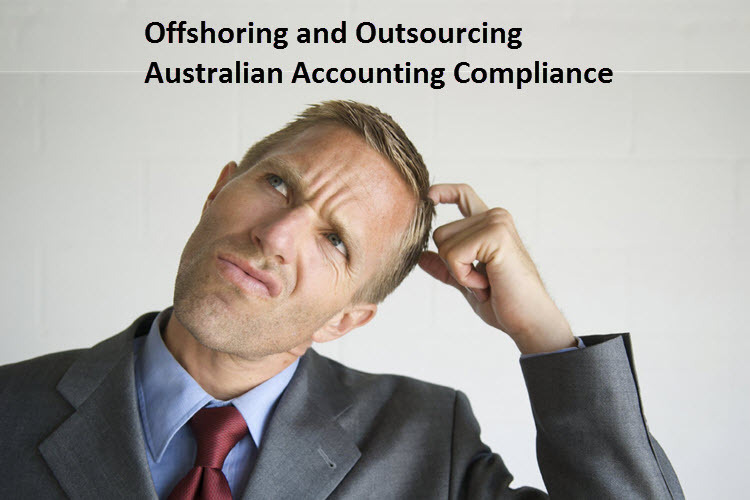 Are there any activities which are inappropriate to be outsourced? For example: Debt recovery where offshore staff are communicating with Australian individuals who may be in difficult situations. Consider the methods of communication and document responsibilities for building and maintaining communication platforms e.g. VOIP phone, software tools, database management tools, workflow management tools, screen sharing tools etc. Does the OSP share their office with any other firm? Does the OSP perform any other work apart from accounting? Are USB’s disabled or restricted? Are there security cameras in the office? IT security is probably more likely to be missed than physical security, as the IT security is a logical construct, and not easily viewed. As recent stories in the Australian news have shown, many Australian businesses do not have sufficient protection for their data. If cloud technology is deployed, what are the security procedures implemented by the OSP? Does the OSP’s accountants have full control of confidential data at all points in time? Does the OSP have external IT support or any other external service providers who can access data? How does the OSP ensure legal security? Is the OSP legally required to comply with any legislation? What might be implementation issues? Are specific job descriptions and well documented workflows in place for all job functions to be outsourced? Are staff working out of serviced offices or other locations (e.g. home)? Have you considered incorporating your own entity in an offshore jurisdiction? Have you considered the software to be used? Including online management tools and workflow management tools. The legal issues are probably just as important as any other part of the due diligence. More so if you consider that the legal issues are only really need when things go pear shaped. Are there any client disclosure requirements e.g. engagement letters ? What is privacy legislation the OSP operates under? What are the legislation, standards and requirements of government bodies, regulators and professional bodies? How is client confidentiality treated? This is your opportunity to conduct a decent digital review. We’ve seen some amazing misrepresentations come from OSP’s e.g. showing photos of the building how it was 30 years ago when the building housed banks, where as now the building has a supermarket on the ground floor and is next to a car wash! Search online about the OSP, its principal and executive officers. Have any of them appeared in Australian or local news in a positive or negative light. Look at social media deployed by the OSP. Regular postings showing employee well being is a good sign the OSP cares about their staff, and recognizes the importance of staff well being to their business. Check the quality of the OSP website – its articles, blogs and testimonials. Check other services the OSP provides by searching online, make sure they aren’t running a tour company on the side! You should take all of the items into consideration to make sure that your resultant decision brings the best possible benefits to your firm. The right OSP will assist you with the short-term activities as well as stay in line with your long-term business strategies.